This is the perfect vacation home to welcome you into your exciting, fun-filled dream vacation. It comes complete with everything from TVs in each Master suites to your very own private pool. Whether you�re out at the parks or sightseeing around the Central Florida area, you�ll look forward to returning to this vacation home each day! 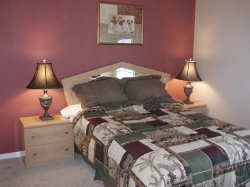 The villa was remodeled in Spring 2005, so you can enjoy new furniture, linens and towels. This beautiful home with many upgrades is located in Indian Creek community. This is the closest residential community to the magical Walt Disney World complex, off the 192, just 3 miles or 5-minute drive from the Disney entrance. Orlando international airport is only 20 minutes away and all other attractions are within easy reach by car. This home features 4 large bedrooms, 3 full bathrooms. Sleeping arrangements include 2 master bedrooms - one with a king-sized bed, a large walk-in closet and an en-suite bathroom with garden tub, shower and double vanity basin. The other master bedroom has a queen-sized bed with its own en-suite. The third bedrooms has a full bed and a twin bed. The fourth bedrooms has a daybed with a trundle, which can be easily converted into a kind-bed. Bedroom 3 & 4 share the 3rd bathroom. It�s ideal for two families sharing! The home has a fenced and screened pool (heated if requested), and a large pool deck. Lots of sun and very private! There is a comfortable living room with cable TV, DVD player, VCR and PlayStation2, an elegant dining room, a large kitchen with all modern amenities and a breakfast dinette. The living room has 15� vaulted ceiling, with sunroof. It also has a large elegant French door accessing to the pool and patio. All living areas and bathrooms are furnished with high-quality Italian ceramic tiles.